Oi! Casper punkers. 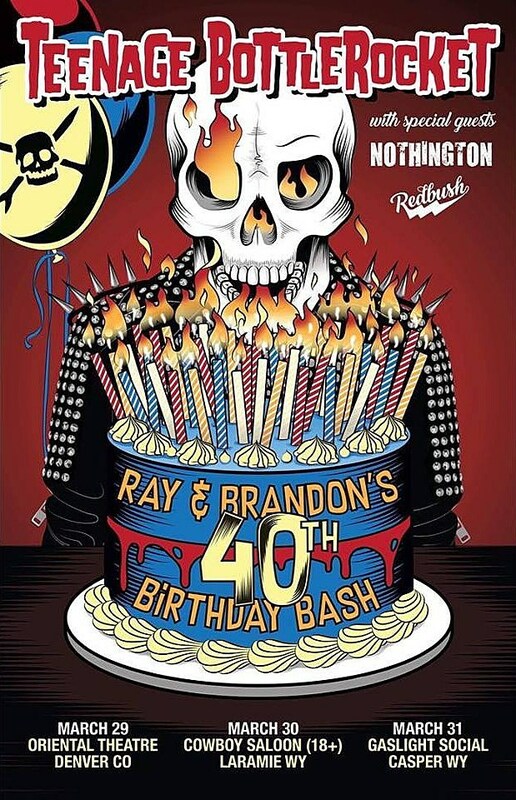 It is Brandon's and Ray's 40th Birthday celebration, and Casper is getting a present. This is probably the cheapest you will ever get to see Teenage Bottlerocket. Ever. Seriously did we get stuck in some time-warp thing with ticket prices from the 90s? On March 31st, the Wyoming punk rockers will play the Gaslight Social for only $5. The show starts at 8 PM. It is 21 and up, and you can only get tickets at the door. Typically a TBR show costs over $20 a ticket. Fellow Laramie punks Redbush and The Hybrids are opening the show. TBR are taking a local pitstop on their world tour. Yes, a local Wyoming band is on a world tour. They are rocking Denver, Laramie, Casper, and a few other cities in the U.S.; then the group is off to Germany, Portugal, and Spain. To think that Wyoming only makes country music... pst.